RouteBuddy and OpenPisteMap have announced the availability of free worldwide ski maps for use with Atlas, RouteBuddy's iPhone app. To cache your local ski map, simply locate your ski resort and use the 'Download and cache' key to store the map over a WiFi connection in the ski lodge or at home before you leave. Then you can access the map tiles in the resort without incurring expensive roaming data fees. RouteBuddy Atlas is available free of charge in the iTunes Appstore. More details over at the RouteBuddy website. Looks promising, but it's almost impossible to tell which way the lifts and runs run - they need arrows (there are tiny arrows on the lifts, but they're pretty hard to see). The terrain doesn't really help as it's not coloured, so again, you don't know which way the terrain lies. No three valleys coverage yet which is quite suprising (unless I've missed it?). It's a community map, which there isn't an equal of, no matter what data is extant in what you see. If your favourite resort isn't covered, or covered that well, then get out there with Atlas and get logging and mapping! 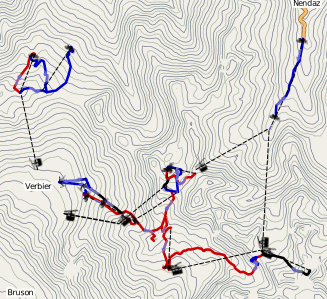 I spent Christmas in Adelboden testing this out and although Ad's was well mapped it was great fun adding to the map things like restaurants, runs through the trees and other data. Don't worry I've got two trips booked to the three valleys this season. I'll probably log it using my QStarz datalogger. Then, when I go back out there two weeks later I can test my own maps and fill in the blanks I've already contributed to OpenStreetMap so I'm familiar with the process and software and hopefully OpenPisteMap is very similar. Some of the problems I mentioned though, are not data related - it's just the way the data is rendered. Some kind of arrows which are more visible in the render would be very useful. I'm not sure if you have any influence on that? Don't worry I've got two trips booked to the three valleys this season. I'll probably log it using my QStarz datalogger. Then, when I go back out there two weeks later I can test my own maps and fill in the blanks I've already contributed to OpenStreetMap so I'm familiar with the process and software and hopefully OpenPisteMap is very similar. That's great, glad to hear of your support for OSM. Sorry Nick, I missed replying on that item. You are right in that the data isn't sometimes clear for use, neither is it on the pictorial ski maps either (as a tedious and costly ride back to Courchevel proved to me last year). Something like chevrons for the direction of a piste would be an aide I'm sure, and the top and bottom of lifts could be marked in some way. If you want three valleys coverage try the Val Thorens app which has a pre cached map of all three valleys and plots your location arround the resorts so no network data expence. HERE LIES PND May it rest in peace. Is there a link? and a cost? As it is made or commisioned by Val thorens it is free. Probably for the advertising. But for this reson it is one of the best map images I have seen, let alone the gps facility. I have tried over a dozen free and paid for ski resort apps and am yet to find something I really like. I am hoping this might fit the bill. I will be testing iTrailmap 3D in march, but this app costs 2.99 and lacks the the ski runs, but is a full 3d gps data logger. After a quick check I have found Val Thorens and the rest of the Three Valleys on Routebuddy. So now I have another app to test in march! But with a critical look around and I mirror the suggestion about directional markers for peists but it can be worked out using the lay lines. What I do particularily like is that the routes and lifts are named properly but again my only criticisum is that you have to zoom quite close before they appear. I am in the middle of caching some tiles for a couple of tests but I am liking what I see so far!